I'm having one of those days again... The kind where all I want to do is sleep and my energy level is well... *ZZZzzzzzzz* Oh sorry, what was I... Oh right energy, doesn't exist for me today. I would much rather lay down and sleep the day away than share this recipe with y'all. Sorry if that offends or upsets, you know I love you guys, just have absolutely no drive or vision today. But I wanted to share this fantastic recipe with y'all! Peel and cube the potatoes and place in a stock pot and cover with water. Cook on medium-high heat, bring to a boil and let cook about 20-30 minutes or until fork tender. Once cooked, drain and place back into pot, then add in milk and butter. 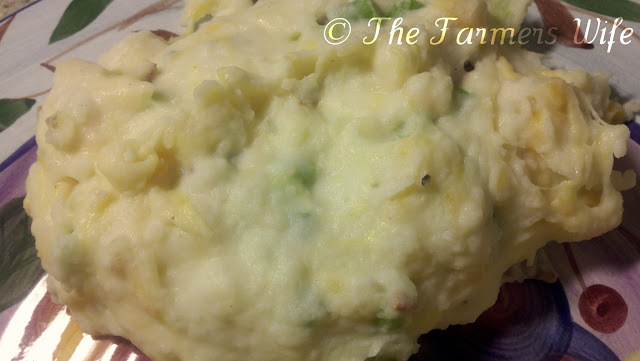 Using a potato masher, mash the potatoes until creamy and mostly if not fully lump free *You can use a hand or stand mixer to mash the potatoes I just prefer the old fashioned way. * Add the sour cream and spices and mix well. Then add your cheese, cooked diced bacon and green onions and stir. Serve warm. We really enjoyed this, and did not miss the fat in this recipe AT ALL! I will be making this repeatedly. 5 stars! Love turkey bacon! Love when you can lighten up recipes! Sounds good! I love potato's! Looks so yummy! I love taters! Yes, when restaurants ask if I want my potato loaded, I know that means more toppings but much more fat and calories. Nice to know I can have loaded mashed potatoes without so much fat and calories with your recipe. Great post! I don't think my family would even notice these were a lighter version...they look fabulous! Oh nice I like this lighter version! Thanks for sharing! Those days happen from time to time...I am having one today as well. These taters look awesome! How perfect! I would have never thought to use turkey bacon! I love mashed potatoes and these sound just perfect! I love loaded mashed potatoes and I especially love your lighter version. What a great idea to use turkey bacon! :) I can't wait to try these out. Thanks for the recipe! Kim this sounds delish!!! Just bookmarked!